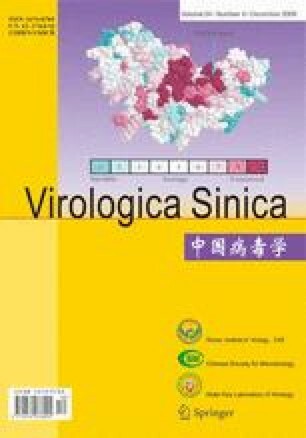 This paper reports the confirmed diagnosis by nested RT-PCR of PPR cases in Tibet, China in 2007, and results of phylogenetic analysis. Results showed that the 11 tested samples were PPRV positive by nested RT-PCR, of which 2 samples were genetically close to the X7443 strain (Nigeria 75/1) of lineage I, and 3 samples close to the strain AY560591 (Sungri96) of linage IV with 96.6%、 97.3%、 97.6% and 98% nucleotide sequence homogeneity respectively, based on partial sequencing of the F gene from 5 samples and complete sequencing of the N/M/F/H genes from one sample. This study suggested that there are at least 2 origins of PPRV in China. Foundation items: This work was supported by project from MOA [2006-G57(3)B-Z1] and Project from Yunnan Province (2008LA019). Food and farming group, International Trade Core Function. 2007. Peste des petits ruminants (PPR) in China. International Disease monitoring, Preminary outbreak assessment. Department for Environment Food and Rural Affairs, VITT 1200/BT-China, 27 July 2007. (http://www.defra.gov.uk/animalh/diseases/monitoring/pdf/ppr-china080714.pdf).